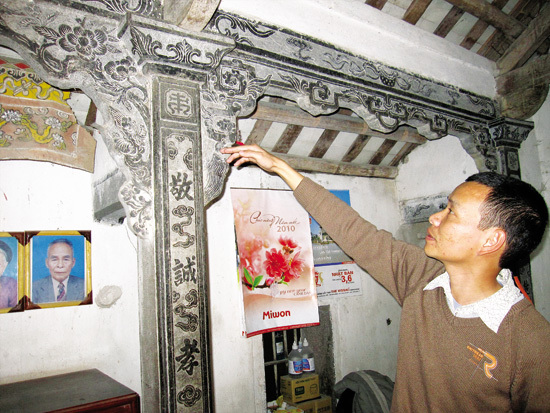 Being a stonemason living in a village specialising in stone products, Mr Do Khac Duc, of Ninh Van village, Ninh Binh Province, 90 km south of Hanoi, decided to build a beautiful stone house for himself. But he was afraid his wife would not agree, as they were so poor they did not have enough rice to eat. So he told his wife that he had received an order to build a stone house, and brought stones home for his wife and children to work. The wife often asked the husband: ‘Why don’t you ask for some payment for this house?’ He would answer that the customer would pay after the house was built. After four years of work – from 1954 – the stone was ready. The wife was surprised when she saw her husband calling their relatives to help erect the house on the plot their ancestors had given them. Mr Hoang said, ‘The pillars were very heavy, so a lot of relatives and also neighbours came to give us a hand. There was no cement at that moment, so our dad had to use cooked sugar cane juice mixed with lime to make a glue that could stick stones together. The amount of stone used to ran to tens of cubic metres. Stone was plentiful on mountains near the village, but to get it out was a huge effort, as there were no machines. Holes had to be made in mother rock and wedges and hammers used to break pieces away. It took a mason a morning to make just one hole. Dun mountain (Núi Đụn) is where Mr Duc used to get stones. After months of wedging stone away, he had to wait until the level of water in a waterway rose and used banana trees to make rafts to carry it to the village. He also used wooden rollers. Smoothing a parallelepiped pillar took a month; a cylindrical pillar took almost two months, then more months to carve and engrave.